A few weeks ago, my youngest boy invited friends over. I wanted to bake something for them, so I browsed through my recipes. I found an orange pound cake recipe, only to realize a few minutes later, that I only had one orange left in the fridge. Oh, well. 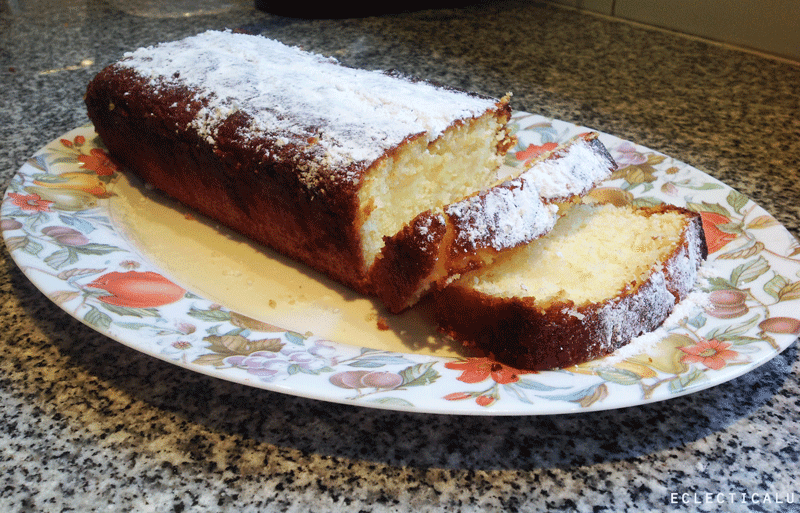 After pondering between the possibility of either running to the greengrocer or using lemons, which I did have, and luckily lots of them, I decided to go for a lemon pound cake, using the same recipe. The results were equally delicious and very, very lemony. It's clearly a lemon lover kind of pound cake. Me! Are you one of us? Preheat oven to 350 degrees. Butter and flour loaf pan. In a bowl combine sugar, oil, lemon zest, lemon juice, and eggs, one by one. To that, add sifted flour and baking powder. Mix/beat until smooth. Pour batter into loaf pan. Bake for 35 to 45 minutes or until a knife or a toothpick inserted into the center of the cake comes out clean. Let the cake cool and then turn out onto rack. Wait for the cake to cool completely, and then add glaze. *For the lemon glaze you will need: Read below why glaze is not in this photo. Stir sugar with lemon juice. Done! Has this happened to you? Have you ever started a recipe and found later on that you didn't have all the ingredients? What did you do? P.S. The most delicious lemon brownies ever. Yummy !!! Wanna try it ! Great Vale! Thank you for stopping by and I hope you like it!